The first distributed EERIE magazine...Collector's Edition from Warren. The classic black and white horror comic magazine. Slight chipping on cover. Artists in this issue: Frank Frazetta (cover! ), Gene Colan, Jack Davis, John Severin, Alex Toth, Gray Morrow and more! The James Warren classic horror black and white comic magazine! Fourth issue of this terror-ific mag with top flight talent: Gray Morrow, John Severin, Steve Ditko, Frank Frazetta, Alex Toth, Al Williamson and more! Note: Some slight cover wear. Vintage black and white horror comic magazine from Warren Publications! In this great issue: The Swamp God Attacks and more fantastic stories. Artists include: Frank Frazetta (Cover! ), Gene Colan, Steve Ditko, John Severin, Alex Toth, Al Williamson, Wally Wood! Wow! Vintage Warren black and white horror comic magazine! Note: crease across from cover. 1966 classic issue with artists: Dan Adkins, Gene Colan, Steve Ditko, Frank Frazetta (Cover! ), Alex Toth, Al Williamson and more! Note: Tape along cover spine. 1967 vintage black and white horror comic magazine from Warren Publications! Great artists issue: Frank Frazetta (cover! ), Dan Adkins, Gene Colan, Steve Ditko, Alex Toth, Al Williamson, Wally Wood and more! Original 1967 magazine. Some cover wear, but overall in great shape for a 1967 magazine. Used but complete. Warren magazine with artists: Neal Adams, Gene Colan, Frank Frazetta, Alex Toth and other greats! Used with slight cover wear and chipping. Original 1967 magazine. Used, but readable and in good shape. This James Warren publication features great artists like Dan Adkins, Tom Sutton, Jeff Jones, Joe Orlando and others! A great, great issue of Eerie from Warren Publishing. In this issue: The Stalkers, Pursuit of the Vampire, Untimely Tomb and more. Artists include: Alex Toth, Reed Crandall, Al McWilliams and others. Great shape! Appears unread. Just age tanning. Slight wear on spine and small crease on back cover. Warehouse find! Unused original 1968 EERIE magazine from James Warren Publishing! 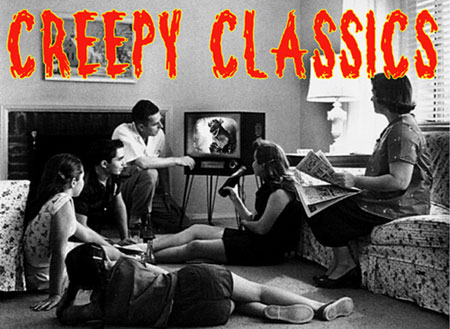 Great black and white horror comics that our moms all frowned upon... In this issue, lots of monsters with art by greats: Pat Boyette, Gray Morrow, Joe Orlando and more. Classic Warren. The classic black and white horror comic magazine! Artists in this issue include Gene Colan, Reed Crandall and Gray Morrow. Condition, well worn cover, small chip out of back cover, coupon filled out on page 47, but not cut. Pages intact, very readable. The classic black and white horror comic magazine. Artists in this issue incude Frank Brunner, Mike Ploog, John Cornell and more. Condition: some reading and shelf wear, but still solid and readable. The classic black and white horror comic magazine! This issue from 1980. Condition: Light reader/cover wear, but not bad at all. Large size issue in very good shape. Classic EERIE issue! A "Best Of" from the earliest of the run. Stories by Archie Goodwin. Frazetta cover, art by Steve Ditko, Dan Adkins, Gene Colan, Tom Sutton...best of the best. Some slight cover wear, Tiny chip out of cover, normal age tanning.